In the poem “The Road Not Taken,” Robert Frost writes, “Two roads diverged in a wood, and I– / I took the one less traveled by, / And that has made all the difference.” Those lines were exactly what struck my mind on that day when I had a chance to ask a calligrapher at a flea market in Hongdae to write a phrase on a blank bookmark. I hesitated a little, and the old calligrapher looked at me questioningly, waiting for me to say something. That is how I got my one-and-only bookmark five years ago. At the time I was a twelve-year-old who had dropped out of elementary school. The teachers were astonished when they found out I was no longer coming to school. Why would such an obedient, high-achieving ‘model student’ decide to leave? They even suspected my parents of perhaps persuading me or even forcing me to drop out. Yet it was undoubtedly my own decision: a painful but firm conclusion I had reached after months of deliberation. Before deciding to homeschool, I had become keenly aware of how I was not living the life I really wanted. My everyday routine was a puppet of the school system – I was taught to read books the school chose for me, study the material they gave me, and behave as the school wanted. I could feel myself gradually turning submissive and stereotyped. Even worse, it was me who mended all the tiny cracks in the walls of my world and never let a single sprout grow on it. I wished to be a perfect student whom everyone admired. 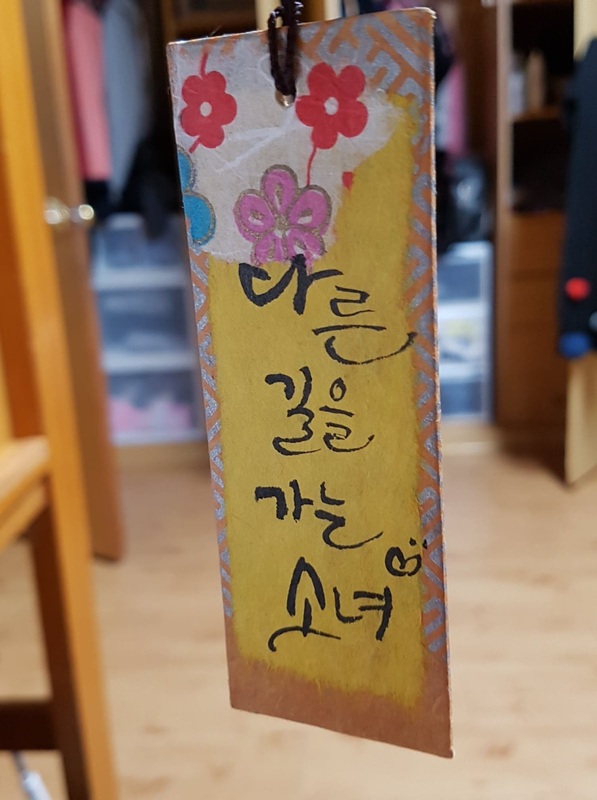 The yellow, flower-patterned bookmark with the dancing calligraphy on it holds so much meaning and value. It does not only show that I took the other road by becoming a homeschooler; it means that I dare to stay who I am no matter what the circumstances may be. Entering high school and trying to fit in has recently made me place more of my thoughts in a mold. However, I try hard not to forget the idea I have repeatedly been telling myself for years – that I should try to fit in but at the same time let my spirit break free of unnecessary restrictions. Of course, the road not taken is not all sunshine and rainbows. Trying to remind myself of my own desires in the midst of wide-spread social conventions was, and never will be an easy task. I had once felt miserable and even ashamed of the fact that I was a teenager but not exactly a student. Sometimes I still feel alone and consider myself a lone wolf. In spite of all, what makes me continue strolling along the road not taken is the pleasure that comes from discovering the rarest values and experiences. My yellow bookmark will always be with me on the path, telling me not where to go or where not to go, but pointing in the direction where I truly wish to go.